477HP DETROIT DD15/10SPD STICK/APU/LEDs! High power super reliable Detroit DD15 at 477HP coupled with an easy to downshift Eaton Fuller ten speed trans, 3.42 rear ratio to power up any slope with the biggest loads! 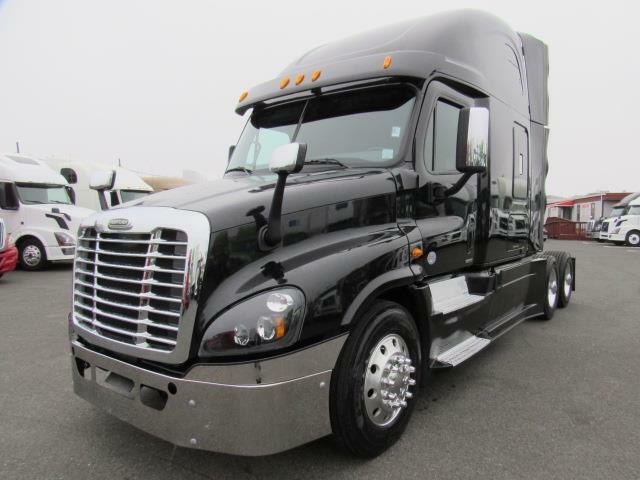 Big spacious 72 inch raised roof sleeper, Cascadia Evolution aero dynamic package with flared chassis fairings and body trim to increase aerodynamics saving you fuel, APU which means main engine was not idled night after night assuring you of longer engine life and saving you thousands each year in fuel costs, hood mirrors to reduce blind spots, LED headlights, fog free heated power mirrors, power windows/locks, trailer brake, kingpin release in cab, suspension drop, front air ride, engine block heater for easy cold starts, traction control and diff locks to get you out of snow/mud, hands free phone Blue Tooth/AUX/USB!